Eeewwwww, creepy crawlies! Just kidding — with three boys, you’d think I’d be used to them by now, heehee! Thanks for all you do! 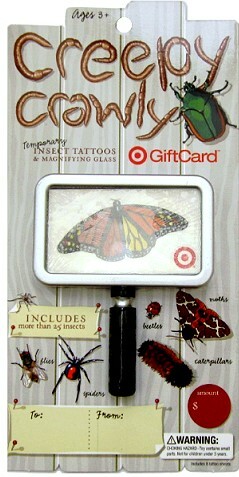 It wouldn’t “bug” me to win this gift card! Thanks. Hope I win, this could come in handy right now! Of course, I like you on FB! I already like (actually love) totally target on Facebook! I Just had breast reduction surgery and need new clothes!! 🙂 I love target. I already like you on FB!!!! Cool looking gift card ! I like you on FB too. Thanks! Here is my entry:-) like your insight! I need a shopping fix…great give-a-way! Thanks for the fun giveaways. Love your website and all the deals you post. Thanks!